Over 100 students participated in the Undergradute Research Conference on April 18 in Wiekamp Hall. The sound of tape being torn could be heard as posters were hung. Refreshments had been set out to greet the early morning guests and the line at the registration table in Wiekamp Hall had never been longer than it was at 9 a.m. on April 18. 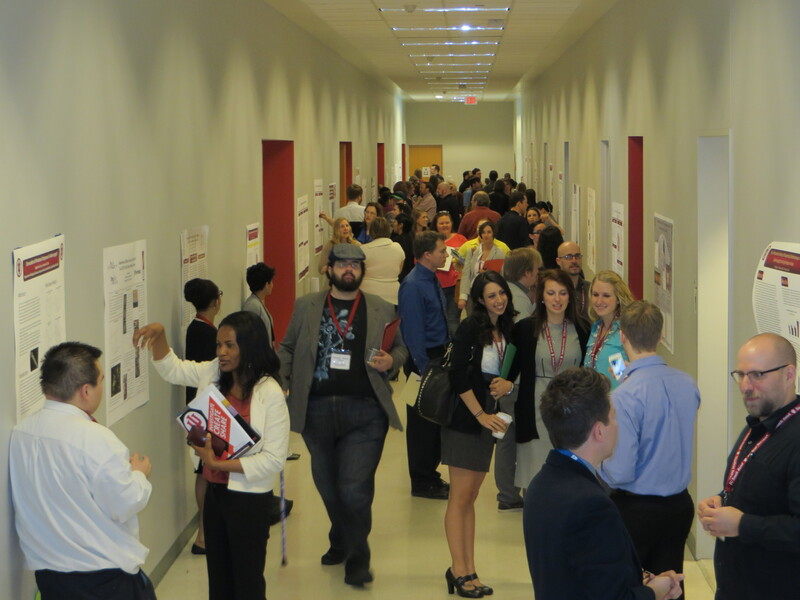 While some may have thought that this was just another Friday at IU South Bend, others knew that the culmination of their studies was about to be looked upon by fellow students, faculty and judges at the 2014 IU South Bend Undergraduate Research Conference. More than 100 students participated in this year’s event, allowing their studies and accomplishments to be viewed across 15 panels and 26 posters. Not merely just an exhibit of personal work and research, the URC is a chance for students to be engaged with their peers, allowing for thoughtful discussions and the exchange of knowledge. As the hallway continued to fill with people, conversations about psychology, physics, gender studies, history, biology and various other forms of research contributed to an atmosphere of genuine desire to learn from one another. Within each of the classrooms, teachers prepared to introduce the students who would be presenting their work and research for each of the panels. Despite a slight technical problem with the classrooms’ computers, IU South Bend’s staff was able to persevere and quickly resolve the matter in order for the day’s events to continue running smoothly. Each presentation was thorough enough to spark questions from the audience, as well as brief enough to allow those questions to be answered. Through and through, the students showed a professional attitude backed by knowledge and what seemed to be an eagerness to discuss their ideas with peers and faculty alike. This same professionalism was on display during the poster presentations in the hallway that was filled with people for the entire hour before the next panel session. Students that presented their work in this format were each given wall space to showcase their research, methods and conclusions. From the digitization of the Cripe-Witter Cemetery and social interaction in online gaming to the effects of serotonin on mosquito larva and acoustic transducers, the students explained their research with enthusiasm. Alice Do, a senior at IU South Bend currently studying the effects of serotonin levels on the feeding rates of mosquito larva, knows that her research can help benefit others. “I want to see if there’s an overall effect on the ecosystem,” Do said. The day’s events continued to run smoothly into the second round of panels. The topics during this set included how health and wellness relate to economics, deconstructing normative reality in literature, feasible solutions for sustainability, gender identity and various samples from the humanities. The humanities samples included topics on a post-human era, the psychoanalysis of literature and resident aliens. During the lunch break in the Student Activity Center’s conference room, presenters, judges, moderators and guests had a chance to relax and socialize. It was during this break that three of the five research journals were unveiled and made available to those in attendance. These included “Analecta,” the “Graduate Research Journal,” and the “History Research Journal.” The “Undergraduate Research Journal” and “New Views on Gender” were still in the printing process at the time of the conference. After remarking that the 2014 conference was the largest yet, Chancellor Terry Allison congratulated the students for their hard work. “You’ve taken the plunge into academics, but also into presenting your research,” Allison said. Following the luncheon, the conference reconvened at Wiekamp Hall for the last round of panels. During this last iteration, topics of mental health, marijuana and genetically modified foods were discussed in one room while trauma, gender, melodrama and social sciences were discussed in each of the designated event rooms. With the conference drawing to a close, those still in attendance migrated toward the exits, constantly stopping to continue the discussions emitting from each of the presentation rooms. While many of the participants at the URC were finished with their research, there were others that had more work ahead of them. Event Coordinator and Assistant Professor of Political Science Jamie Smith urged attendees to share of their experiences.